1 medium orange contains 60 calories and 3 g of dietary fiber. Oranges are also good sources of vitamins C and B9 as well as minerals like potassium and calcium. The vitamin B9 or folate in oranges helps prevent birth defects in pregnant women. The vitamin C in oranges helps prevent premature aging and maintains a healthy immune system. 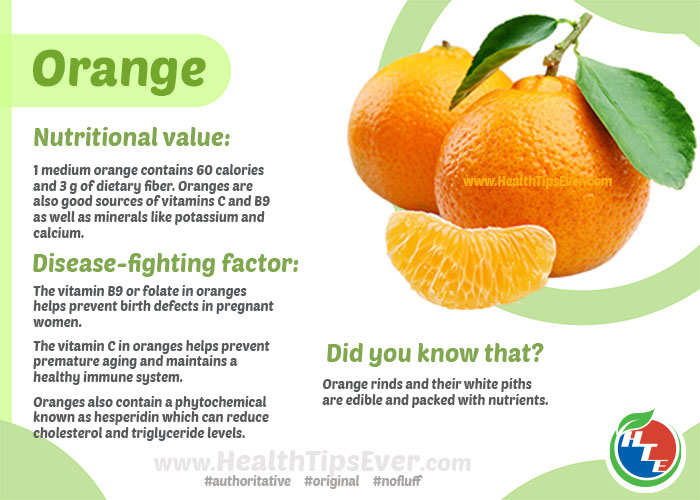 Oranges also contain a phytochemical known as hesperidin which can reduce cholesterol and triglyceride levels. Orange rinds and their white piths are edible and packed with nutrients.